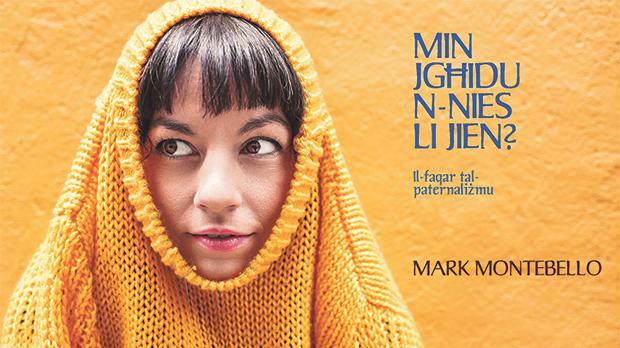 A new book, Min Jgħidu n-Nies li Jien – il-Faqar tal-Paternaliżmu (Who do people say I am – the poverty of paternalism), written by Mark Montebello, explores paternalism from all sides. It discusses paternalism on an interpersonal level as much as on the institutional and legal levels. The book, published by SKS Publishers, examines how we come in contact with paternalism (Part 1), what is the origin and justification of paternalism (Part 2), the poverty of paternalism (Part 3) and how paternalism can be countered (Part 4). Paternalism is basically when someone treats others like irresponsible and immature infants. It can be a father with his children, the husband with his wife, a girl with her boyfriend, an employer with his employees, a department head with his workers, a superior with his subjects, a magistrate with arraigned people, a doctor with patients, a priest with his parishioners, and the like. It can also be on an institutional level: a government with its citizens, a bank with its clients, a company with its customers, and so forth. Everyone is in the danger of becoming a victim of paternalism as much as everyone can treat others paternalistically. In all these cases, the paternalist person assumes an attitude with which he or she decides for others without their consent, or represents others without consulting them. The paternalist assumes that he or she knows more than his or her victims how they should live out their lives, what decisions they should take, what constitutes their happiness, what personal identity they should adopt, and what future best suits them. In the last reckoning, paternalism is a question of control, manipulation and exploitation. The book, in Maltese, presents a complex and difficult issue in easy terms, simple language and with many examples. It also carries a number of illustrations and graphs that explain the theme for effectively. Highlighted quotations give the subject better clarification. The main aim of the book is to provide means of recognising paternalism in its different guises, and, possibly, fight against it.